The Ogles of England are well-documented, but little has been written about the Ogles of Ireland. While they’re related to the Northumberland branch, Ireland’s volatile history makes it difficult to prove direct lineage. My wife Sue, is a descendant of James Ogle, who immigrated from Ireland around 1798. 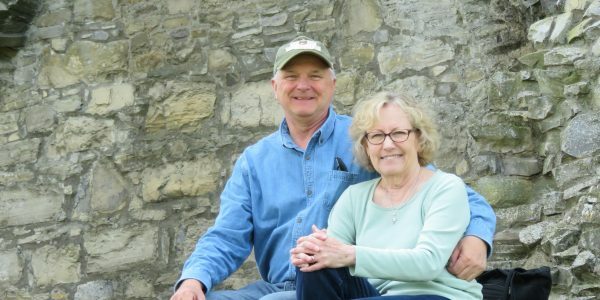 For the last few years, I’ve researched the Ogles of Ireland online, as well as local family and Irish history centers. 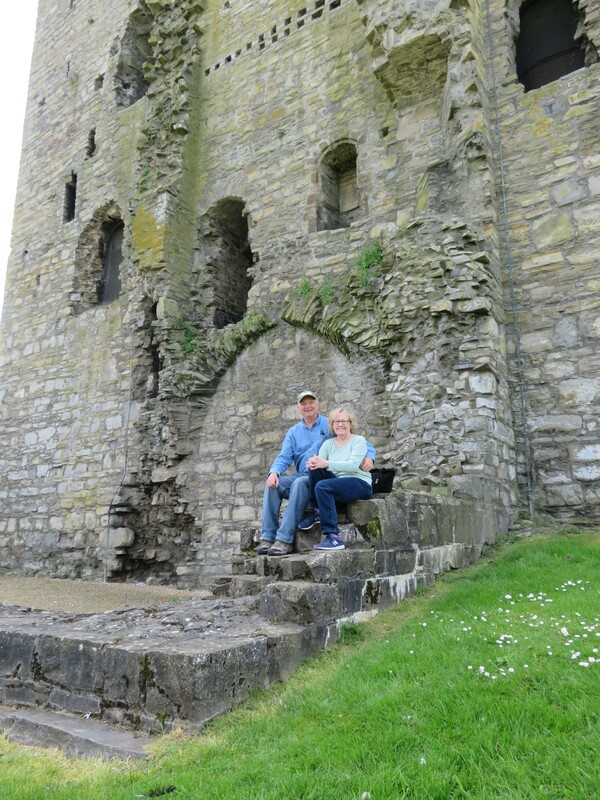 In May 2016, we vacationed in Ireland for three weeks. It was a great experience that exceeded our expectations. We spent about a week touring historic sites that may be connected to Sue’s ancestors. We also spent a day at the Public Record Office of Northern Ireland (PRONI) to research the Ogles. 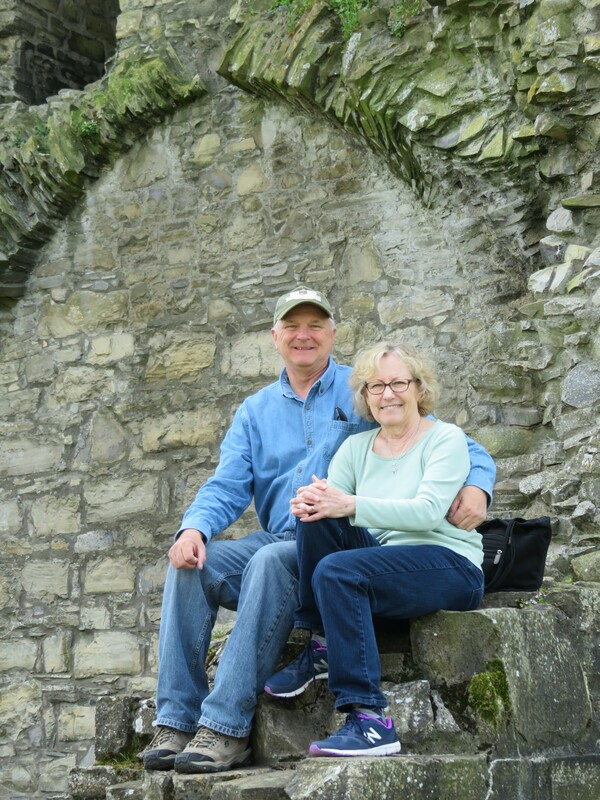 We saw ruins of a small castle near Enniskillen that Clinton Ogle helped build in 1613, and posed for pictures in front of the original 400 year-old fireplace. We went to a farmhouse built near Pettigo in the 1600s that Ogles may have held or inhabited for 200 years. The current owner told us that the old stone house withstood a battle, and showed off some large cannon balls and musket rounds found in the garden. 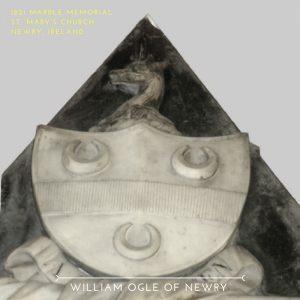 1821 memorial to William Ogle of Newry, Ireland (©2016 Jim Dix 2016). In Waringstown, we visited a beautiful church. Built in 1681, we sat in the booth that the family of John Ogle of Waringstown probably used in 1700. In Newry, we photographed an 1821 marble memorial inside of St. Mary’s Church. Dedicated to William Ogle of Newry, Superintendent of the Canals, it’s crowned by the family’s arms and resembles those from the Ogles of Hirst, Staffordshire, and Shropshire. We also saw the house he built during the mid-1700’s. It overlooks the town’s river and canal locks. Even though many Irish records were destroyed in a 1922 fire, PRONI had unexpected volumes of documentation. Some originals still exist and are protected in an atmospherically controlled location. Sue and I were able to request about twelve ancient documents, which were delivered in boxes containing many other related records. The 1714 Indenture to Marriage of Alice Ogle of Waringstown was the first document she reviewed, while mine was the 1777 will of John Ogle of Waringstown. Both were folded into the size of an envelope, and very large when opened. These hand-written originals also had wax seals next to the signatures. Each document identified family relations, along with information mentioning directives for significant sums of money during the 1700’s. After taking notes, we moved on to examine more boxes of data. Much of it dated to the 18th and 19 centuries, and usually related to the Ogles in some way. Given the volume of information and limited time, we barely scratched the surface before the librarians showed us out. 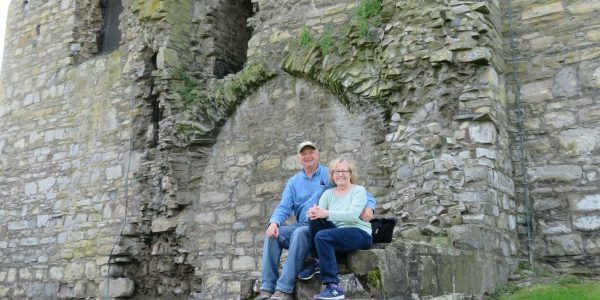 While it’s unlikely we’ll ever return, plenty of research still lies ahead for the Ogles of Ireland. So, I wrote a paper covering some Ogles in Ireland between 1600 and 1800. Read it in volume 37 of The Ogle Genealogist (TOG v.37). This entry was posted in Newsletter and tagged Ogles of Ireland. Bookmark the permalink.